Doing so well too right up until the last half-inch – The Diesel-Electric Elephant Company. We saw none of these green, blue, red and yellow balloons while travelling. I suspect that Google is telling porky-pies in re these landmarks, landmarks which, had they existed, might have been useful to me in my navigations. Naughty Google. I am speaking to you today from the bridge of H.M.S. Cardinal Wolsey, still heavily under the influence of coffee, curry and something the paramedics called “Industrial Valium”. A couple of nights ago, while the enemy was sleeping and wholly unawares (that is to say, at about ten o’clock in the morning), we slipped our moorings and made our way out into the mountainous waves and howling winds of the canal. I am pleased to report to you, the peoples of England, and indeed the peoples of the world, that due in no small part to the fortitude, bravery and sheer dumb luck of those serving aboard, the Cardinal, and his cargo valued beyond rubies (that’s me, btw), has reached the comparative safety of new moorings. Goodbye Cholmondesley, hello Hack Green. Although mercifully free from attack by submarine, shark and scuba-diver, our journey was not without incident. There were several occasions when I had to be lashed to the wheel, and several when tying me up wasn’t enough, and I had to be just plain lashed. The “The Meteorological Office”, doubtless under the influence of – well, I was about to say “Russian” agents, but pick a country, any country, since the whole globe dislikes us so – under the influence of [your choice of] agents, had arranged a somewhat breezy day for our moving, with wind speeds of 30 to 35mph. Ever devilish and cunning, these winds had been so arranged as to blow almost wholly sideways in some fiendish attempt to make our navigation appear to those unfamiliar with matters nautical, somewhat crab-like. In truth, at times, we were being passed by crabs walking in a straighter line than we. If I may so declare, roughly some 7.1838 miles of our desperate and arduous journey was completed without incident, entirely free of “Timothy West” moments. I hit nothing, disturbed no-one (other than the crew, and my disturbing them is “business as usual”) and, using every skill learned at my Mother’s knee (she was captain of a whaling ship for some years), I threaded the Cardinal through each and every bridge-hole more neatly than a small camel through the eye of a very large needle. Then came the last half map-inch of our planned route, the last half-mile. This final section, I am sad to report, resembled nothing so much as the tribulations of Mr Robinson Crusoe, but with less sand, fewer palm trees and almost no coconuts. Not quite the scene of my Robinson Crusoe moment, and I have no intention of walking back and around the bend just to photograph it. Somewhat pressed for time due to the vagaries and inadequacies of the hansom cab services plying their trade in rural Cheshire, and the need of the crew to disembark and return to base (before Matron even suspected that they had absconded), it was my intention to moor before the locks at Hack Green. Oh happy and gullible inexperience and naivety. We reached the stretch with our destination in sight, chose somewhere decently open and un-disconvenient-esque to shipping, and began our manoeuvres without the assistance of tugs. I rang the chadburn repeater to cut the engines, intending that the 35mph cross-wind would, for once in its damnable life, make itself useful by blowing us to the towpath. It did that alright, oh boy did it do that. We were pinned and pinned solidly. I was reminded of those occasions at school when the teachers Duct-Taped me to the walls, usually just before the school buildings were locked for holidays or, on one really hilarious occasion, closed for demolition. Anyway, what-ever. No bugger told me that there is an underwater obstruction running almost the entire length of the towpath before Hack Green when approaching from the north. It’s not in the canal guides, online or on paper. I got the poor Cardinal wedged securely upon it, two-thirds of a country yard out from the bank. Two thirds of a country yard is one giant leap for mankind, wholly inadvisable for anyone wearing a medical or indeed military truss. Moreover, having once found the obstruction there was nothing I could do to get off it. We were pinned by what the Science Officer calculated was some 800kg of wind blowing at ninety-degrees onto the side of the boat. Neither enthusiastic forward nor hopeful reverse would persuade the bows off the obstruction and, while the Science Officer may be built like Charles Atlas after the invention of spinach, even he couldn’t pole us against the wind. As every Boy Scout will tell you, Force = Area x Drag coefficient x Wind Pressure, where Wind Pressure = 0.613 x Wind Speed squared. We were royally stuffed. I did the only thing that I could under the circumstances. I railed at the wind, I cursed the gods and I think I wet myself a little bit (but we’ll gloss over that, thank you very much indeed). A civilian vessel heading on a reverse course to our own, on request, rendered passing honours in close formation and at full speed, but the wash did not, as I had hoped, bleakly, improve our situation. We waited. We waited in plain view and in a wind so strong that – and, forgive me, there is no gentle way to say this – a wind so strong that I … had to remove my tweed flat-cap, for fear of losing it to Neptune’s collection. The remainder of manoeuvres were thus performed, effectively, wholly naked. Presently (“presently” is a term used by writer-types to denote the passing of some “I have no idea how long we were waiting” chunk of the fourth dimension) a second civilian vessel appeared, heading in the same direction as ourselves. I would like to report that information regarding our distress was passed in a dignified manner, with semaphore flags and signal lamps, but in fact I just waddled up the tow-path at top speed, cupped my hands and yelled from the bank like an idiot. Needs must when you’re entirely out of ideas and about as experienced as a new-born lamb. A deal was struck involving gold and one of the better-looking young midshipmen in which this other vessel would pass closely, offering both a decent tug of wash and some shelter from the damnable wind. My part in the plan was to power us along with the pull of the wash in the lee of the passing vessel, all while taking great pains to not actually collide with them. Just the thing a novice needs to try on such a windy day, with someone else’s boat (and stern gear) at risk, as well as his own. Well, dangle me from the silly-mid-off mast or the boundary mainsail or whatever they’re called if it didn’t work a treat. A touch of diesel welly, some judicious waggling of the steering-stick and we came free – and I managed to not ram the vessel that had come to our salvation. This is always regarded in nautical circles as “a bit of a bonus”. The RNLI and RAF Search-&-Rescue were formally stood down, the Vicar that I had engaged to stand on the towpath and sing verses from “For those in Peril on the Sea” was paid off (2/- 3d and a promise to purchase raffle tickets towards the vestry roof repairs), and I motored us along just far enough to get pinned against the bank again on the lock landings. No shelter from the wind – no shelter – no shelter – suddenly, shelter. Praise the gods and give the cat a dish of milk. Taxicabs having been thoroughly missed (unlike in Midsomer Murders, there is no mobile telephonium signal in the real world), we waited while the Bro and I turned back from shades of something akin to Dulux’s best-seller, “Polar-bear’s Bum White” through something more in the line of their “Baboon’s Bottom Puce” and then to our more customary “Pinkish-Purple-Beige with blue rag-roll effect”. Pacemaker mechanisms were re-wound, everything was allowed to air off in a hedgerow, and after the grounding the two locks seemed like mere child’s play. Actually, they were child’s play. Transport of a commercial nature was eventually arranged for the crew later in the evening, fresh-baked baguettes and mugs of toh-mah-toe soup were enjoyed by all (that’s both of us) and a couple of Vera Lynn records were played on the electric Dancette, just to show that we weren’t broken. We shall never speak of this grounding again, shall we? No, seriously, please repeat after me, “yes, Ian, we shall never speak of this grounding again”. Thank you. Matter closed. Thanks to the Olympian efforts of the crew, I am now within easy tottering distance of somewhere I have wanted to visit for a while – a “secret” nuclear bunker, a left-over from the earlier phases of our constant, never-ending, currently-escalating-wildly-again Cold War. I shall visit at the earliest opportunity, and report. Cardinal Wolsey is the boat in the middle. The perspective here is deceptive (I think that the perspective-engine may be broken), for we are well past the lock landings and on the (winterised) visitor moorings. It goes without saying of course, although I shall say it, that today there is less breeze than one might find up a Scotsman’s kilt after an evening on the whisky and Rogan Josh. Ruddy typical, eh? Chin-chin until I report on the Secret Nuclear Bunker, asap or sooner. Arrg, avast behind and other such phrases! Thank you sir, very much appreciated. Woke this morning to find a sharp frost, but the sun is rising now and before long it will be another spring day just like yesterday. Splendid stuff. Aye, you’re most welcome, Captain! Old Man Winter hasn’t given up on us yet here. We might see some decent spring weather in a month. It’s funny that you should mention that- the winds today _are blowing onto the stern of the boat! 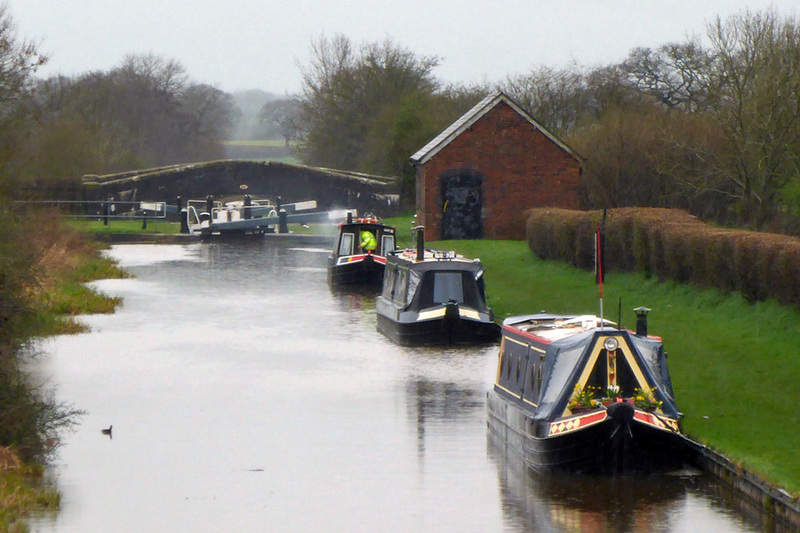 😉 I often look at narrowboats and wonder whether the human frame is capable of holding itself together at three or sometimes even four miles per hour… if my blog suddenly goes silent you know that I’ve found the answer! Loving your writings ! So exciting. I had to lie down.